In March 2018, a coalition of some 60 NGOs, led by the Universal Rights Group, the UN Association of the UK, and Human Rights House Foundation, sent a letter to the UN Secretary-General, António Guterres, encouraging him to enhance the selection procedure for the new High Commissioner for Human Rights. The sponsors of the letter argued that the process used to select and appoint previous High Commissioners was not fit for purpose, and argued that a failure to improve this time round would risk undermining the legitimacy and authority of the next High Commissioner, as well as the credibility of the United Nations. Unfortunately, six months later, it seems clear that the Secretary-General ignored this call by civil society, overseeing an opaque and confused process that may actually have constituted a step backwards compared to previous appointments. In their letter, the NGOs underscored the important and increasingly challenging nature of the job of High Commissioner. With this in mind, they argued that the selection process for the new post-holder (as set down in GA resolution 48/141) must be enhanced to be fully meritocratic, transparent, inclusive, and engaging for civil society and the general public. This would increase the chances of finding and appointing the most highly qualified candidate, ‘one whose impartiality, objectivity and non-selectivity are such that she/he can command the respect and authority needed to effectively perform each facet of High Commissioner’s diverse duties.’ The NGOs also noted that improvements to the selection process were important in order to bring the procedure to the same standard as that used for other senior UN/international appointments, including those introduced in the context of selecting and appointing the Secretary-General himself. In the letter, the coalition of civil society actors put forward a number of proposals to revitalise and enhance the High Commissioner selection process. These included: publishing a formal set of selection criteria; improving the global visibility of the formal call for candidatures; publishing a clear timetable for the selection process that enables adequate assessment of candidates; publishing an official list of candidates; and conducting wide and inclusive consultations, including with civil society. The coalition finally received a reply from the Secretary-General on 8 June. In the meantime, and in the absence of any discernable ‘opening up’ of the selection process, the usual Geneva-New York rumour mill had kicked into action – with numerous names and lists circulating between diplomats, usually via Whatsapp. One name that appeared from the very start, and who was rumoured to be the Secretary-General’s preferred choice, was Chilean President, Michelle Bachelet. The Secretary-General’s reply to civil society can be read here. In it, he said he would follow the ‘established process’ for selecting and appointing the next High Commissioner. He explained that he would shortly circulate a note verbale to States requesting nominations, and, in a welcome move, would also ask civil society nominations He especially encouraged the nomination of women candidates. Beyond these points, the letter did not respond to the key questions, concerns or proposals set down in the civil society letter of March. A few days later, note verbales/calls for candidates were circulated among States, NGOs and NHRIs. A number of diplomats remarked that the call for applications was quite late (mid June – in the past, the process had begun earlier, around March). This further fed the Geneva-New York rumour mill, with some openly wondering whether it (implicitly) meant that either: a) Michelle Bachelet or another favoured candidate had already been approached for the position but had declined, and thus the Secretary-General was urgently seeking new candidates; or b) Michelle Bachelet or another favoured candidate had already been informally approached and had agreed, but the Secretary-General nonetheless needed to create the appearance of an open and transparent process. In July, news began to circulate that Michelle Bachelet had definitely said ‘no’ to the Secretary-General during a meeting in New York. A week or so later, a short-list of around 6-7 candidates (3-4 Latin Americans and 2-3 Western Europeans) were – according to New York ‘chatter’ – interviewed by a panel of internal and external experts. 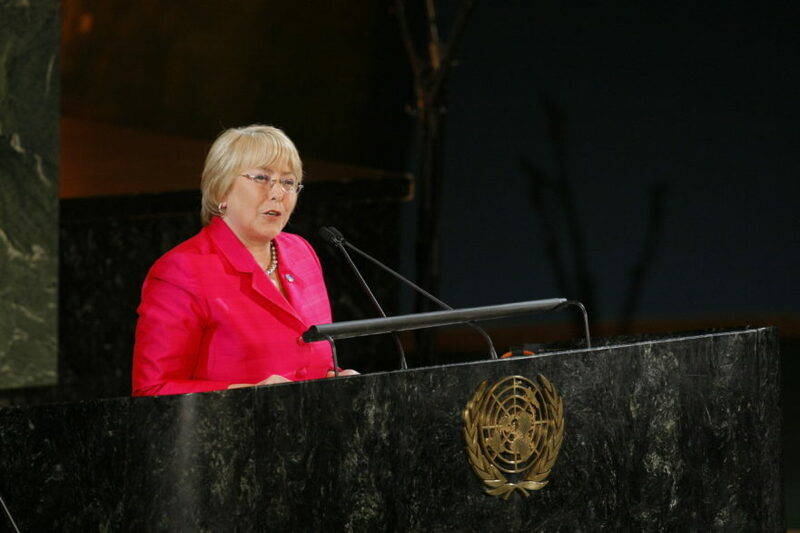 On 8 August, it was announced that the Secretary-General had, after all, chosen Michelle Bachelet to be the next High Commissioner for Human Rights, and that she had accepted. Her nomination was approved by the General Assembly on 10 August. While there can be little doubt that Ms. Bachelet was an extremely strong candidate, and will likely make a first class High Commissioner, confirmation that, in the words of one UN observer, ‘it really was her all along,’ raises a number of questions about the selection process. Ever since the start of the year, it was rumoured that the Secretary-General wanted a clean break from the tenure of Zeid Ra’ad al Hussein. While Zeid had proven himself to be a highly principled and eloquent High Commissioner, regularly and publicly speaking ‘truth to power’ and calling out serious violations anywhere in the world, it was nonetheless the case that he focused, principally, on one part of the High Commissioner’s mandate (i.e. acting as a global human rights watchdog, and ‘voice of conscience’). The Secretary-General was said to want the next High Commissioner to equally focus on other (less contentious) parts of the mandate, such as human rights diplomacy, providing human rights services and capacity-building assistance, driving human rights ‘mainstreaming’ across the UN system, and acting as an ‘honest broker’ in efforts to strengthen the efficiency and effectiveness of the UN human rights system. Considering the current state of human rights around the world, disagreements among States as to the purpose and prerogatives of the UN’s human rights pillar, and the pressures (including budgetary pressures) on the UN and the multilateral system, it is perhaps not surprising that the Secretary-General had a very clear and somewhat inflexible ideas in his mind about the type of person he wanted to be the next High Commissioner. It is therefore, by extension, perhaps understandable that he was keen to keep a tight control over the selection process. Nonetheless, it remains disappointing that Mr Guterres did not seize this opportunity to bring much-needed and valuable improvements to the High Commissioner selection and appointment process – the same improvements that he himself benefited from in the context of the Secretary-General selection process. As noted above, there seems little doubt that Michelle Bachelet is ‘the right person for the job.’ However, at a principled level, it is surely wrong that the UN High Commissioner for Human Rights, a position that supposedly embodies and seeks to project core human rights principles such as equal opportunity, meritocracy, transparency and freedom of information, inclusivity and non-discrimination, and due process, was appointed via a procedure that did not seek to fully uphold these very same principles. Feature photo: UN WomenExecutive Director Michelle Bachelet spoke at the celebration of the launch of UN Women. UN Women/JC McIlwaine. 24 February 2011.